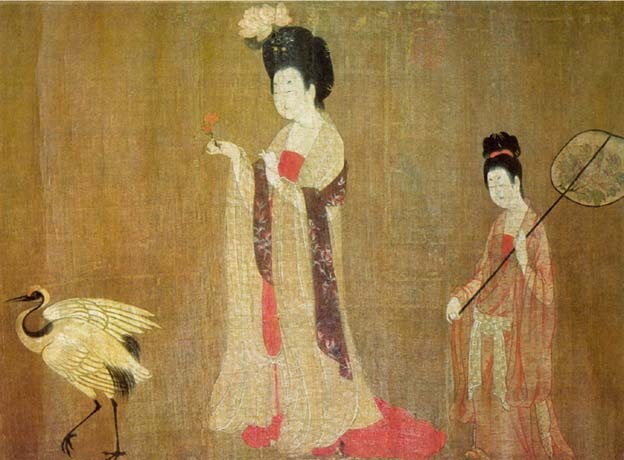 Introduction: Images from the Tang dynasty 唐朝 (618–907) present us with independent and powerful women, conferring the idea that the Tang dynasty was the one era in Chinese history in which the patriarchal grip was not as tight as during other dynasties. Sculptures of women on horses, some of whom are playing polo, and sculptures of the influential voluptuous concubine Yang Guifei 楊貴妃 (719–756), whose fate nearly overshadows that of her lover emperor Xuanzong 玄宗 (685–762); murals from the Dunhuang 敦煌 and Mogao caves 莫高窟 of merrily dancing ladies, female poets, China’s only female emperor Wu Zetian 武則天 (625–705): all these images strongly bestow ideas about independent women. Nevertheless, the Tang dynasty’s social system was patriarchal. While the initially mentioned images convey a happier picture of women than, for example, the accounts of bound feet in later eras do, and while Tang women therefore might appear liberated, women clearly belonged to a lower order than men and female independency was in general impossible. Certainly, some women were nonetheless able to ﬁnd niches to live without men, but they were then deﬁned by being husbandless. In short, women were, above all, supposed to become wives and bear children, especially sons.